On July 23 a report said Mohammad Yama Aini, a counselor to the Afghan Mission in UN, beat his wife so severely that she ended up in hospital in Flushing New York. Report said Mr. Aini was not charged because of his diplomatic immunity. The news spread all over social media in Afghanistan and became a hot topic among Afghans on internet. While women rights activists condemned this act, many refrained from discussing the issue further because Mr. Aini was said to be linked with the Minister of Foreign Affairs, Salahuddin Rabbani who is also a member of Jamiat-e-Islami party. 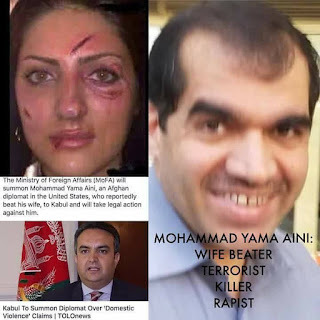 Others chose to say that those who talk about this incident of domestic violence are actually doing it because of Mr. Aini’s political affiliations to Mr. Rabbani. Others tried to shove the issue under a rug by saying: this is their personal matter. Many others called this act of Mr. Aini a black spot on the name of Afghanistan.